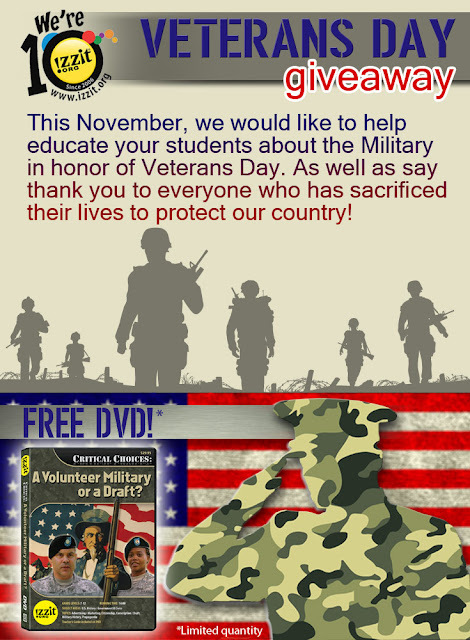 In honor of Veterans Day on November 11th, we are giving away Volunteer Military or Draft? for your classroom. The code is: VETERANSDAY2016 and must be entered on the secret landing page here. Log in to your account or create a FREE account before entering the code. Labels: Army, Classroom Discussion, Critical Thinking, educational DVDs, Free Teaching Materials, Giveaway, izzit.org, Military, November, Teaching, Veterans Day, Volunteer Military or Draft? Fall 30 Sale - Bigger and Better!